Work and stress go hand-in-hand. But for educators, stress levels seem to be increasing at a worrying rate. A recent report backs up this concerning information. According to the study, 46% (almost half!) of teachers say they experience high stress on a daily basis. Plus, between 30 and 40 percent of teachers leave the profession within their first five years. Teachers feel worn out for many reasons. But chief among them is the worry that goes along with high-stakes testing. Teachers are driving themselves to the brink of madness with the pressure to deliver the “right” results on these tests. I see teachers leave their classrooms every day feeling defeated. They stay late at night, they work on weekends. And it’s just not making a difference. Teachers aren’t happy. Students aren’t happy. And no one is succeeding. But I see a solution to this problem. For the past 20 years, I’ve dug into the research on the connection between happiness and productivity. And time and again, the research says that a positive, engaged brain is the greatest competitive advantage a business (or school) can have. Companies across the country are recognizing this research, too. They are incorporating wellness and happiness programs. They are putting value on the mental health of their employees—and they’re seeing an increased competitive edge. Schools are starting to adopt this practice, too. They’re discovering that when their staff have the tools and techniques to increase their optimism levels and wellbeing, stress is reduced and better results are seen. 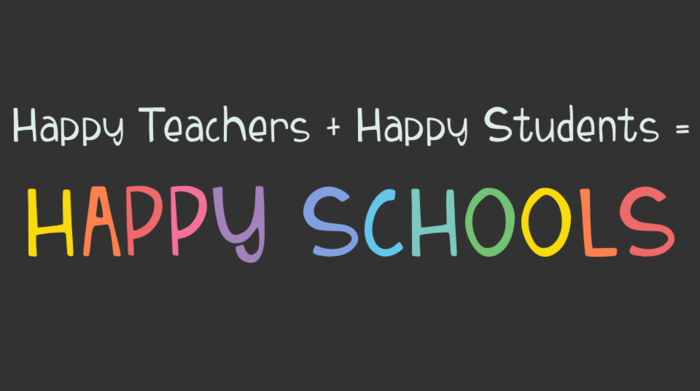 Bottom line: Everyone is happier, and it’s reflected in the attitudes and successes of both teachers and students. So, if you’re one of the 46% of teachers experiencing high daily stress levels, it’s time for an adjustment—to reset yourself toward positive. And I want to help! And hey, Administrators, you can help your teachers stress less. My keynotes on The Science of Happiness and Shifting to a Positive Mindset are having an amazing impact in schools across the country. Bring me to your school to let me inspire your staff—and see happier teachers, happier students, and a more positive school culture! Question: Does your school promote wellness or happiness initiatives? What are they, and how have they improved the school culture? Comment below or share on Facebook or Twitter.